With a conversational voice and hard-won optimism, a cancer survivor shares her spirited story. In Not All Bad Comes to Harm You: Observations of a Cancer Survivor, Janice Mock reflects on the silver linings of having a life-threatening illness. 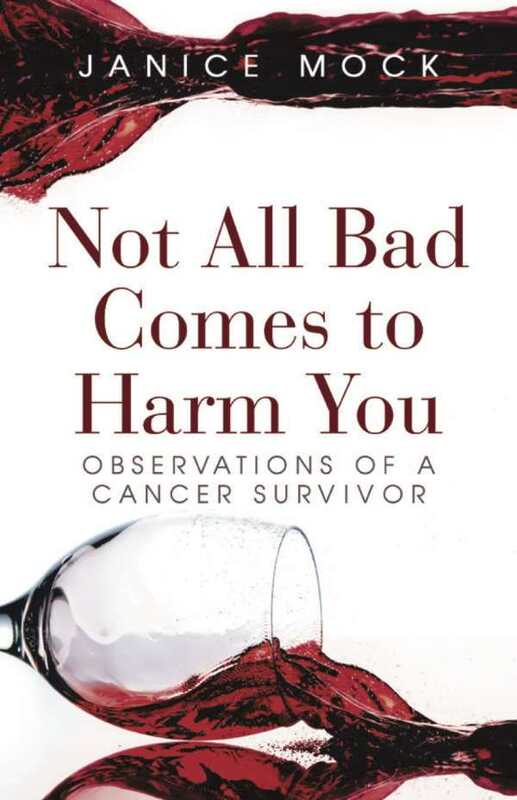 Highly focused, topical chapters reveal a powerful will to endure while discussing cancer’s ability to sift real friendships from temporary ones, to force patients to refocus their lives, and related topics. Interspersed with occasional blog posts, this clear account offers fellow patients a hopeful portrayal of one possible journey: to view cancer as a fact to be faced, and not as a reason for despair. Diagnosed with ovarian cancer, Mock chooses not to dwell on the darker side of illness, nor to join a support group. Instead, buoyed by loved ones, she continues living with a spirited outlook despite the reality that some types of cancer often recur. Her memoir avoids frightening statistics in favor of interspersing personal interests—including travel to Italy and competitive bike racing—with scenes in medical offices and thoughts on work, relationships, and love. The result is a well-structured, telescoping view of the disease, with cancer sometimes at the forefront and at other times a distant detail in an otherwise vibrant background. Whether musing on a Penguin Cold Cap—a device meant to reduce the hair loss often experienced during chemotherapy—or contemplating humanity on a transatlantic flight, the book remains upbeat. Difficult moments are acknowledged without drama. Even hardship provides occasional humor, as when Mock remarks that she’s “saving a ton of money on grocery bills” after six rounds of chemotherapy affect her taste buds. The work consistently reaffirms the importance of choosing a positive view without turning hazy, overtly spiritual, or repetitive. The writing hums most in succinct chapters, such as the poetic opening paragraphs of “Little People Doing Little Things,” and when it introduces specific moments—including the gift of a friend’s postcard and the city of Rome—later returning to them in ways that gradually build emotional resonance. Less rewarding sections address the incongruity between the reality of needing to work and the realization that many tasks in the course of regular employment turn meaningless after cancer—points that build toward familiar questions on finding purpose. Still, the general exhortation to appreciate life in all its brevity is worth hearing. With its crisp tone and hard-earned optimism, Not All Bad Comes to Harm You celebrates the people who helped Mock on her journey. Cancer becomes a catalyst for renewed perspectives, a challenge to meet head-on, and in a surprising, simultaneous way, a nuisance to “ignore” while pursuing various passions. At times conversational and at other times meditative, this book is written in an engaging voice.